This was the first national park in Venezuela and opened in 1937. It is a haven for tourists and scientists because of the mountainous regions and the coastal plains. The park is very important for irrigation purposes to the country and also contains one of the finest cocoa plantations in the world. Set in the hot spot of the Andes Mountains, the tropical location creates a diverse biological ecosystem that brings scientists from around the world to study. The "cloud" forest that sits there holds over 150 different species of trees and the nino or cucharon is the most represented. There are over a 140 species of mammals living there, as well as 580 different species of birds, 97 reptiles and 38 various amphibians. To make it even more fantastic is the fact that over 1 million species of insects live and thrive in the park area. There are many threatened or endangered species living there including the plain-flanked rail, yellow-faced siskin, the red siskin, the white bellied monkey, long haired spider monkey, bush dog, tapir, American crocodile, Veragua stubfoot toad and the Hercules beetle. Many species are symbols of the park and these include; the jaguar, red howler monkey, trogon, harpy eagle and fruiteater. The national park itself is on the verge of endangerment because of forest fires, hunting and pollution and finally human encroachment. 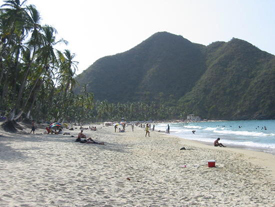 The Caribbean Sea is the northern boundary, and while the majority is within the Aragua state, some is in the Carabobo state; which makes the park the biggest protected area of the coastal mountain range. The elevation goes from the interior heights of the mountain range down to the sea level which is by the sea; the cloud forest on the mountain sides, then deciduous and semi-deciduous forestations, savanna vegetation and along the coast thistles and thorn bushes. There is a gap in the mountain range known as the Portacheulo Pass that allows the birds, insects and bats to migrate from the northern hemisphere. It is a shame that this park is located in the confines of a country that is very unstable and always seems to be on the verge of revolution; because of the dictators that take over the government in promise of better conditions for the people. Unless a government that remains stable and consistent is brought to rule then the condition of this forest, park, animals and other ecological treasures could become extinct. More emphasis needs to be placed on saving these countries from themselves then the oil rich mega messes in the Mideast. The only endangered species there are the nomadic peoples that have been fighting for centuries and regardless of who tries to come in and change the way they run their country, the outcome will always be the same. It was at the end of the Korean conflict, the Vietnamese conflict, the Iraq conflict and it certainly will be for the Afghanistan conflict. For a country to go into Afghanistan, after two other countries have fought there and left without any significant results is bordering on either stupidity or outright lunacy. It is your choice. The museum is located on the former air force base and the first air force military school in Aragua state and is the only museum that is devoted to the rise of aviation in Venezuela; and the third most important in the continent. It is found in the city of Maracay, Venezuela where Colonel Luis Hernan Paredes was a civil aviation teacher in one of the old hangars. Miguel Rodriguez was the school commandant from 1946 until 1963, when the then Lt. Col. Paredes took over command to preserve, restore and conserve the many kinds of flight equipment that could be found in the country. The official museum was started by various men in the government in 1963 for the special purposes of saving their avionic devices. Inside are over a hundred various weapons related to aircrafts and aircrafts that were used by the Venezuelan pilots from 1920 until 1970; including a French airliner from the early 20th century, a replica of Jimmy Angel's plane and the Holy Cow, the plane that General Marcos Perez Jimenez left the country in 1958. There is a statue of General Juan Vicente Gomez there which is the only one in the city. Hidden deep within the forests of the Henri Pittier National Park, a strange sights awaits visitors that come here, either by chance or by knowledge. It is a long three storied concrete building that looks very odd sitting in the middle of the jungle with just a dirt path going along the front of the place. It seems that sometime in the 1930s, Juan Vicente Gomez, the dictator ruling Venezuela, decided that a luxury hotel should be built here in the jungle for wealthy visitors coming to appreciate the unique and beauty of the national forest park. Unfortunately for him, however, he died in 1935, and since he was using slave labor to build the hotel, everyone left after he died. It was never finished, although the third floor did get to a stage of becoming a biological station to research the many wonders of this jungle. On the lower two floors, there are a few cots in one room, but the rest of the area is empty with a few places where the floors have rotted through. The mold and fungus has taken over most of the place, although many people have been known to stay overnight here, if they are able. After getting permission from the authorities to do this, the eerie feelings, the weird noises and musty strange smells have created some very scary situations for those staying here. It is as if the slaves that died here, are still visiting the area in their spirit forms. Although the strangeness of the hotel causes some concern among the few visitors that come here, the cloud forest that surrounds it abounds in exciting quantities of monkeys and more exotic birds than you could find anywhere else in the world. The rarity of many of these birds brings birdwatchers to this area since some of the birds that are seen here, cannot be found anywhere else. Known as one of the best car rental companies in the business, Budget Rent-A-Car will get you in the driver's seat faster and without problems. Budget has the best customer service staff and the biggest selection of quality vehicles. Head to our web site now and start getting the best discounts in the car rental business at Budget Car Rentals. 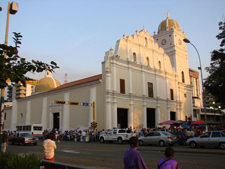 The cathedral was built sometime during the 17th and 18th centuries and is found in the Plaza Giradot in Maracay, Venezuela; although there have been some refurbishments done, it is still the same church that was built on the land donated by the Marquis de Mijarez. This cathedral was where the great leader Simon Bolivar was baptized and it has stood its ground through many earthquakes over the centuries. It is a striking example of the architectural designs of the period and is a place where many works of art and icons have been stored. This plantation is found in the Henri Pittier National Park and has become one of the finest growers of cocoa in the world. Because of the age of the buildings found here, it has been nominated into the UNESCO World Heritage Site. The Casa del Alto was built in 1652, and the Plaza de Secado church was built in 1785 and it is in front of the church that the cocoa beans are dried in the sun. The church was made a National Monument in 1960 and is home to the Pardon Cross or Cruz el Perdon. To get to this plantation, you must come by boat, or traverse the treacherous mountains that block the entrance into this park. The village of Chuao was started in the late 16th century and is completely surrounded by mountains and dense rainforest with the Caribbean Sea to the north. The workers that pick the beans and take care of the plantations are the direct descendants of the slaves that were brought here many centuries ago to build and work for the owners. A very popular restaurant in Maracay, Venezuela is the El Porton de la Abuela where friends meet and families gather for spectacular food. The chef personally involves himself in each dish and presides over the kitchen like a chicken watching its chicks. The linen clad tables and spotless silver and glassware add to the wonderful ambiance that is felt here. The menu is geared towards local favorites with an international spice added for enhancements. Here are a few offerings; barbeque seafood, grilled chicken livers, grilled churrasco, chicken parmigiana, beef tongue with mushrooms, sea bass filet, bread and little arepas, chicken and vegetable soup, rabbit's house pate, Andean ham, Galician octopus, garlic shrimp, cheese croquette, smoked salmon, half dozen snails, cod fish Biscayne, grilled salmon filet, grouper croquette, fiedua, Madrid style belly, oven roasted pork, bologna pistiche, beef stroganoff picat, beefsteak soup, half boneless chicken, fish and seafood soup, cream peas soup, onion soup, cod fish and potatoes Manchego ham and cheese, spinach pancake, meat pastry, beef Carpaccio sea bream steak, snapper filet, grouper and eggplant pistiche, lamb au vine with bistro, Caesar chicken salad, chicken parmagiana, beef medallions in cherry, and much more to please your palette. This plaza was designed after the Plaza de Toros de la Real Maestanza de Sevilla Cavalry in the city of Maracay, Venezuela by the Venezuelan architect Carlos Raul Villanueva. Modeled after the European style of the early 20th century, it was named after the great bullfighter Cesar Giron and can hold about 7000 people. Opened in 1933, when the country was under the rule of General Juan Vicente Gomez, who spent most of his time in this city; which he favored. It has gone through some major renovation recently and is involved in many events and fairs of the city. This bullring is one of the finest in the city and the sands that are the floor for this event and others have seen its share of fights. The square is round in this ring, rather than rectangle or square shaped as most of the bullrings in the world. Everything has been done to the floor of the ring to ensure that the bullfighters don't have any obstacles or protrusions that would trip them up or make that fall during the fights.